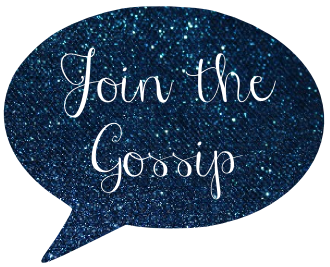 Join The Gossip: Add a Little Dazzle! I am a huge Target lover! I tend to drop at least $100 every time I visit. Sooo not ideal, but I just can't help myself when I walk into the store. They literally have everything. Today was no exception. In addition to purchasing a pair of shorts, two shirts, a cropped sweater, a birthday gift card, and stationary, I also grabbed a stunning headband. I have a Blair Waldorf headband style obsession. They are to die for! Although she hasn't been wearing them as often that doesn't mean I'm going to stop anytime soon. Case and point, the stunner I purchased today. For $9.99 I will def get my use out of this headband. It can be worn with a dressy outfit or make a more plain ensemble a bit more classy. In fact, I wore it to go to a birthday party at a The Room Santa Monica tonight. Am I alone in my headband obsession? Nope, not alone in the headband obsession, I have a friend who is similarly obsessed! What I do share with you is the Target obsession, it is impossible to get out of there without buying at least ONE thing! Great pics, and great blog, I'm definitely following! Thanks for stopping by!! I love these headbands. I always have trouble adjusting my hair for some reason. I used to wear a lot of headbands during my freshmen year in college. I practically had a headband to match every one of my outfits! After reading this post, I think it's time I go back to headbands. 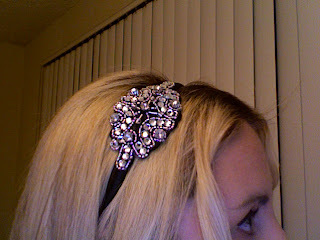 Wow love the headband, so wish we had target here as I'd get that! Headbands rock! You look amazingly beautiful chica! such a lovely headband!! I love headbands!!! Hope you had a nice weekend! Target is such a dangerous place for me and I’ve been trying to bring Geof when I go these days so that I don’t get myself into trouble! Can I just say that your hair is gorgeous?! That headband looks really pretty too. You have got to love Blair and she definitely brought the headband back into style. I love to wear them when I straighten my hair. I hope the birthday party was fun! ps: your hair looks FAB! I'm a huge fan of headbands! I have quite a few, but it's awkward wearing them with glasses. :( So I don't wear them as often as I'd like to. Your new one is so cute! I have this same headband! I wore it to my company's Christmas Party...it is so cute! Very cute! I miss wearing headbands, I used to wear them all the time back in the day. Maybe I should start again, cute way to spice up my wardrobe. Also, LOVE Target. I can spend hours there. Sometimes in the evening I go just for a mini vacay from my son. Noooooooo you aren't!!! Have you heard of ban.do? you looked lovely, your hair was so pretty and the headband is a cutie! That's a really cute headband! I am a headband freak, too! Although they tend to hurt my head, I still where them (in 5 minute intervals if necessary). :) You look super cute rockin' your Target find! Blair Waldorf, I Adore You!